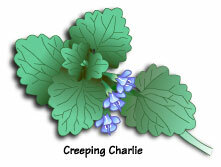 ‘Cause Creepin’ Charlie, aint just any ivy! This time last year I was walking the trail with energetic healer, priestess and aspiring herbalist, Carolyn Bye. This year Carolyn is no longer with us having recently made her transition. She fought the cancer as long as she could and then passed surrounded by the priestesses who loved her. I met Carolyn only three times when she was visiting our healing community in the beautiful blue mountains of Western North Carolina. She was closely associated with Registered Herbalist, Matthew Wood and her knowledge, and her spirit intrigued me. We initially met on one of my plant walks and our second meeting occurred during one of my workshops. That was when she learned about my mercury poisoning and recommended a plant that helps to remove heavy metals from the body. That plant is Creeping Charlie. I had heard of this plant, but wasn’t familiar with its medicinal properties. So, I wrote down the name and intended to research it at some future date. The third and last time that I saw Carolyn was an unexpected surprise. We had been trying to connect before she headed back north, but couldn’t find an opening in our busy schedules. On Carolyn’s last day in North Carolina I stopped by a friend’s house in a small mountain town near to where she was staying to drop off some herbal salve. Upon my arrival I was surprised to find Carolyn there. A small impromptu gathering was underway to say farewell. No one knew this would be the last time that we would see her. While Carolyn and I may have seemed surprised to see each other, we also knew that we were meant to connect. “Did you find yourself some Creepin’ Charlie?” she asked. “Well look no further,” she replied and pointed down at our feet. I looked down and saw that we were standing on a carpet of Creeping Charlie. She pulled some up showing me its stolons, or runners, and square stems. I was in awe of how our medicine always seems to be no further than where we are right now. She was providing me with a personal introduction to this plant and it is always better to have a personal introduction when meeting a new friend. I felt incredibly grateful for having been led to Carolyn in that moment. And as one of my herbal mentors, Willie Whitefeather, always says, “Look down! You are standing on your medicine.” And this is how my relationship began with Creeping Charlie. I offer it up as a tribute to Carolyn Bye. 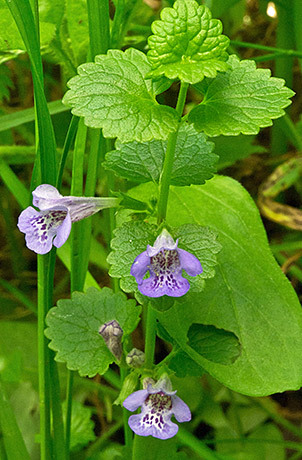 Glechoma hederacea, is an aromatic creeper of the mint family Lamiaceae, more affectionately known as Creeping Charlie. It is an evergreen perennial, which means it is available all year long, even here in the Appalachian Mountains beneath the snows of winter. It has numerous medicinal uses and is commonly used as a salad green. Introduced by European settlers it has become naturalized in North America. 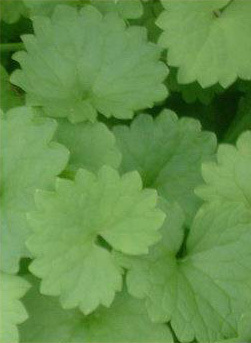 It is not to be confused with Creeping Jenny, Lysimachia nummularia, whose leaves are rounder and flowers are yellow. The size of Creeping Charlie’s fan-shaped, round-toothed edged leaves depends on environmental conditions. The opposite leaves are attached to a square stem typical of the mint family. The flowers tend toward a bluish-violet and flower in clusters of 2 to 3 in the spring. They like moist shaded areas and grow in abundance beneath the trees and along the banks of the creek near my house. Once introduced to Creeping Charlie it wasn’t hard to spot on my daily walks. 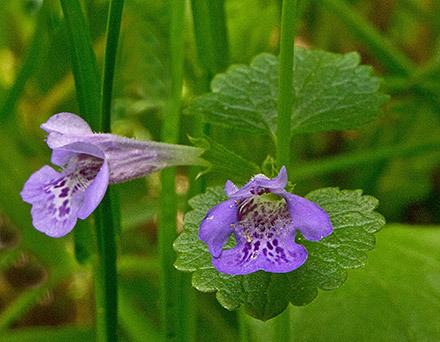 I used to think it was just some kind of ground ivy, which of course it is. Its botanical species name, hederaceae finds its roots in the Latin word for ivy, hedera. Creeping Charlie also appears in sunnier areas especially where the soil has been disturbed and in grass lawns as it is undisturbed by mowing. This is where I initially discovered it with Carolyn. Creeping Charlie spreads easily through root division and seed dispersal and is potentially invasive: one of those pesky weeds. Ha! I have to laugh at the amount of time, energy and money some people are willing to spend trying to eradicate a pretty little edible and medicinal plant. It is an attractive plant and occasionally grown as a ground cover. But make no mistake; Glechoma was brought to America because of its culinary and medicinal uses. It can be made into tea, cooked in soups, or eaten in salads. It has a long list of herbal actions including: diuretic, astringent, expectorant, anti-catarrhal, anodyne, digestive, vulnerary, mild stimulant, diaphoretic, antioxidant, anti-cancer, tonic and vermifuge. 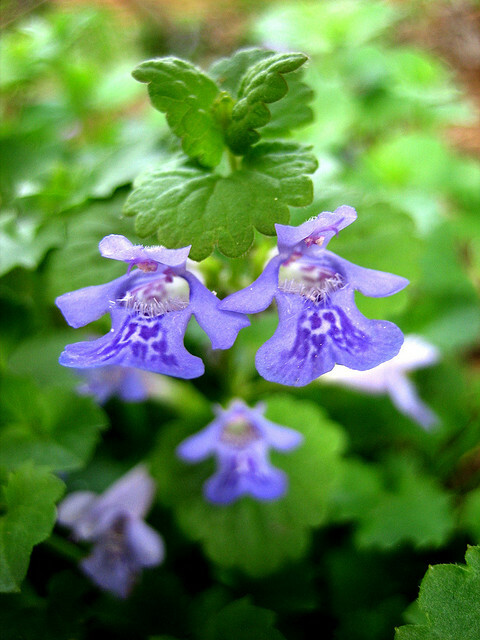 Creeping Charlie is known to relieve congestion and inflammation of the mucous membranes associated with colds, flu, and sinusitis. Studies have concluded that it has anti-inflammatory action, but no clinical human trials on the actions of G. hederacea have been concluded to date. Information on this plant has been purely based on traditional and empirical knowledge. For a plant with such a wide spectrum of pharmacological activity there are very few references of the phytochemical details and chemical composition of its essential oil. Unfortunately, it has long been discarded from the Materia Medica in favor of other plants with a greater certainty of action. Clearly more research is needed. 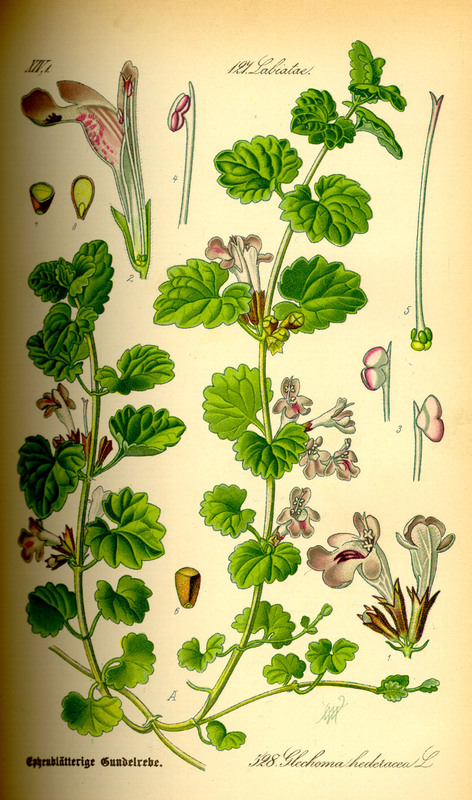 Plants that were once considered cure alls, like Creeping Charlie, in my opinion fall into the category of herbal actions known as alterative. Alteratives gradually restore proper function to the body, increasing overall health and vitality. Their primary action is to favorably alter disordered metabolic processes, especially those associated with the breakdown and elimination of metabolic waste. Their secondary action is to enhance better overall absorption and assimilation of nutrients. Creeping Charlie, abundant and neglected in the Materia Medica though it may be, brings us an important lesson. That lesson is on the importance of having herbalists whose feet are literally on the ground. Researches and scientists in laboratories may be looking down through their microscopes, but knowledge of plant medicine begins in the field by looking down at what is right beneath our feet. It begins with a need for a particular medicine and the receptivity to receive information about a plant from sources other than scientific data. Both perspectives are necessary, but unfortunately the availability of good research is receding from our grasp. This is partially due to government regulation and control of herbal supplements, which relies on the opinions of those who have never given herbs to patients: researchers, manufacturers, bureaucrats, and academics. Other factors include funding sources. With the amount of money that it takes to accurately evaluate the safety and effectiveness of herbal products, government and pharmaceutical company’s involvement is necessary. This further controls and limits, not expands, our choices in health care. I am looking forward to my personal journey with Creeping Charlie and resurrecting this herb from the slumber of disuse. Perhaps this will lighten the toxic load of heavy metals in my system. I know these plants show up in our lives in divine right timing and at the exact moment when their medicine is needed. This is what the Wisdom of the Plant Devas teaches us – It is an Herbal Medicine for a New Earth. Goodbye Carolyn Bye and thanks for introducing me to Creeping Charlie in that last brief moment we shared together. May your journey into the light continue to be guided by those plant spirits and devas that you loved and who love you. The plant devas are already in light body and they are holding open the door. • 1 teaspoon of dried leaves, or 2 teaspoons fresh leaves per cup. Cover with hot, almost boiling water and infuse for 15 minutes. Drink 1 cup, 3x a day. Add peppermint or honey to taste. • Express fresh juice with press and take 1 teaspoon 3x a day. • Note: To use fresh harvest aerial parts April – June. Learn more in Thea Summer Deer’s classes at Wise Woman University.